Published on December 25, 2010 in 2010 Sermons. Closed Tags: Christmas, Communion, Eucharist, Incarnation. Published on April 1, 2010 in 2010 Sermons. Closed Tags: Communion, Eucharist, holy thursday, Last Supper, Mass, Maundy Thursday, priesthood, transsubstantiation. Published on August 16, 2009 in Uncategorized. Closed Tags: bread, Communion, Great Thanksgiving, Real Presence, transsubtantiation, wine. One of my fondest memories of Holy Cross will always be the ecumenical Thanksgiving service we celebrated at the Town Hall with Christ Community Church. This was back when Christ Community was just a house church, before they built their building in South Weare. A team of people from Holy Cross and a team from Christ Community worked together to design the service. We read the lessons and sang together, and then when it came time for Communion we had parallel tracks. Their pastor, Bob Christiansen, explained what they believed and how they celebrated Communion. I explained our beliefs and practices. And then we each did our thing, and people came forward separately, the Christ Community people in their line and the Holy Cross people in theirs. Published on March 27, 2009 in Worship. Closed Tags: Communion, Eucharist, Mass, Worship. 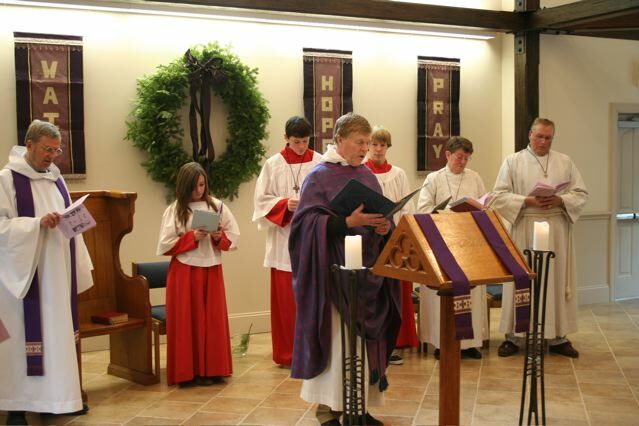 Seasons of the Christian Year (here Advent) are observed in worship.